Previous tests on how alcohol affects the brain have only been done on animals. 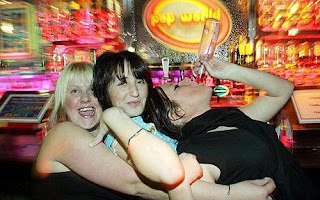 Scientists set out to test the well-known saying that just one drink can quickly go to your head. Only six minutes after consuming an amount of alcohol equivalent to three glasses of beer or two glasses of wine, leading to a blood alcohol level of 0.05 to 0.06 percent, changes had already taken place in brain cells. The researchers from Heidelberg University Hospital in Germany said it is known the brain reacts quickly to alcohol, but wanted to find out how rapid the effect was. Eight male and seven female volunteers took part in an experiment where they drank a specified amount of alcohol through a 90cm-long straw while lying in a MRI brain scanner. The goal was to reach a blood alcohol content of 0.05 to 0.06 percent - a level that impairs ability to drive, but does not induce severe intoxication. The scanner allowed the scientists to examine the tiny changes in brain cell tissue structure caused by the alcohol. Dr Armin Biller, a neurologist at the hospital, said chemical substances which normally protect brain cells are reduced as the concentration of alcohol increases. Other components of brain cells were also cut as more alcohol was consumed. Perhaps surprisingly, the study found that men's and women's brains reacted to alcohol consumption the same way. The team found the harmful effects of alcohol on the brain may be shortlived, but over time cells took longer to repair themselves. Dr Biller said: "Our follow-ups on the next day showed that the shifts in brain metabolites after moderate consumption of alcohol by healthy persons are completely reversible. "However, we assume that the brain's ability to recover from the effect of alcohol decreases or is eliminated as the consumption of alcohol increases. "The acute effects demonstrated in our study could possibly form the basis for the permanent brain damage that is known to occur in alcoholics. This should be clarified in future studies." The research is published in the current issue of the Journal of Cerebral Blood Flow and Metabolism.